Ferretti 500 Fly Bridge Motor Yacht for sale, This 2005 model has only 270hours on her MAN engines, just run in for you! As you can imagine she presents in excellent condition having hardly been used. A three cabin layout excluding the crew cabin allows the Ferretti to accommodate 6 guests for overnight and 12 during the day. She is equipped with bow and stern thrusters, an upgraded Mase generator 20kw, full tropical air conditioning throughout, extra fridges, ice maker, watermaker, Satellite system, Bose Music system, etc. etc. See the inventory for the extensive list. This is an opportunity to acquire a quality yacht in an as new condition from the well respected Ferretti Yard, Italy, builders of Riva, Pershing, Itama, and Ferretti luxury Yachts. Act now this Yacht will be snapped up soon ! Ferretti 500 Flybridge Motor Yacht 2006 model, offers 6 quests overnight accommodation in 3 cabins with en-suite marble bathrooms, Master Cabin, VIP and Twin cabin. There is a crew cabin aft with its own facilities , for 2 crew. Ferretti 500 , 2005 Fly Bridge Motor Yacht with only 270 hours on her MAN 730hp engines, Mase 20kva generator and Bow and stern thrusters. 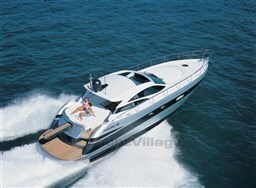 Dear Sirs, I have seen on YachtVillage your offer about Ferretti Craft Ferretti 500 - 2005 (code: 445210). I am interested in the offer and would like you to contact me. Thank you.